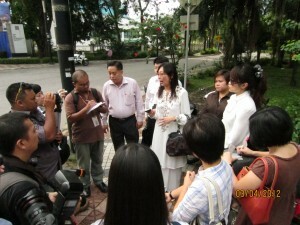 3 April 2012 – Had a press conference at the Police headquarters Bukit Aman before meeting the officers from the “Tatatertib” department. Joining me was the complainant Ms.Lim Hui Hui, her lawyer Mr. Tan and my service center personnel. The meeting with the Tatatertib department lasted for 2 hours with the complainant re-enacting her ordeal at the police station to the investigation officer. Datuk Hashim Bin Abdul Jalil the Ketua Unit Urusetia Tatatertib has given his word that he will undertake this case and he will forward this case directly to the IGP once the report is completed. Today, I held a press conference at my Seputeh Service Centre on a case of police brutality and misconduct that happened to a resident in my constituency. The complainant was falsely detained and abused. Based on her police report, according to the complainant, she was at the bank withdrawing money, early in the morning on 24 March 2012, (at about 6am). Following this, while she was counting her money in her car, she noticed a car with high beams flashing at her. Fearing for the worst she quickly drove off heading home. She then realized that the car which was following her was actually the police. According to her, when she reached her condominium two police officers queried her motives of ‘running away’ from the authorities. After explaining herself, the police officer proceeded to search her car. She asked the police officer why he only searched the front and not the back of the car. The police officer just asked her to be quiet and not to ask so many questions.